I have finally got around to completing the little pillow I have made for my friend who has had a baby girl recently. 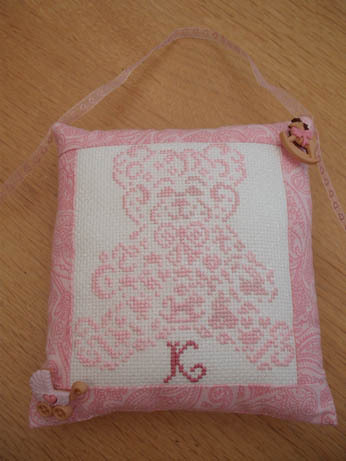 The pattern is again a JBW one, called Teddy Bear – they have cute patterns for all events and seasons not just Xmas ones. I get these mail order from Sew and Sew. I backed the pillow with some of the fabric that I had in my stash left over from my bunny quilt and at the Birmingham Quilt Show I was able to find these very cute buttons which go so well with the design. I don’t know if you can see from the pic below but there is a rocking horse (just above the K) and a pram (to the left of the horse) actually in the design so I thought they were perfect for it. As I mentioned Ellie and I had our first visit to the wonderful Birmingham International Festival of Quilts a couple of weeks ago as part of a coach trip with our group. One day was not really long enough at all but if I had gone for longer I would have been so tempted to spend more! Here is a small selection of some of the lovely things we saw – made into a slide show again with my new toy Smilebox. Yes I love the JBW designs – the way they are made up of lots of other little designs is very clever and very unusual. I have just ordered three more, one for an Autumn exchange coming up ad two other Xmas ones for me! Love the little pink pillow Alison. Thank you – have just had card from my friend so it has reached its home safely! Hope you are well.